Applying lawn fertilizer is an important lawn care chore. Properly fertilized lawns are healthier, out-compete weeds better, and recover from stress more easily than unfertilized lawns. There are many opinions on what is the best fertilizer for your lawn. Whatever you choose, it will help to understand the basics of lawn fertilizers. Applying lawn fertilizer once or twice per year is sufficient. 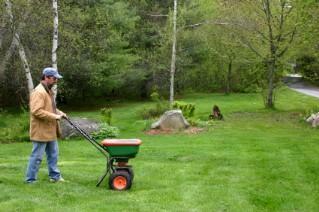 Fertilizer is most helpful at the beginning of a lawn's active growth period. Grass should be green and growing when you fertilize. For cool-season grasses, spring and fall are peak growing times. Feed your grass in the fall: it will store up food over the winter and get off to a good start in the spring. Summer is the peak growth period for warm-season grasses that typically grow in the south. Fertilize in late spring or early summer. You may fertilize again in late summer, but don't wait until the fall. Never fertilize during droughts. Lawns naturally go dormant during droughts and don't need fertilizer because they're not actively growing. 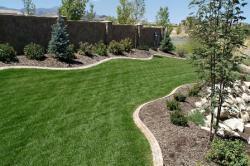 How much fertilizer your grass needs depends on the type of grass and its growing conditions. Grass growing in rich soil needs less fertilizer than grass growing in poor, sandy soil. When starting a new lawn, take the time to properly prepare the soil; it will save you trouble in the long run. If you're dealing with an old lawn on poor soil, it helps to enrich your soil with compost. Once or twice a year, spread an inch of compost over your lawn and gently rake it in. You can reduce the need to fertilize by leaving grass clippings on the lawn after you mow. Grass clippings can supply up to 25 percent of the nitrogen your grass needs over the season. The basic elements in lawn fertilizers are nitrogen (N), phosphorus (P), and potassium (K). Nitrogen promotes growth and keeps your grass green. Phosphorus and potassium are needed in smaller amounts. Potassium encourages healthy root growth and is most important for new lawns. Potassium also enhances your lawn's resistance to disease, drought, traffic, and cold weather. Fertilizer labels identify the amount of each nutrient they contain with a three digit analysis-N-P-K. For example, a fertilizer with an analysis of 27-7-14 has 27 percent nitrogen, 7 percent phosphorus, and 14 percent potassium-or a ratio of 3:1:2. Some chemical lawn fertilizers contain fast-release forms of nitrogen such as urea or ammonium sulfate. This rapidly-dissolving nitrogen causes lawn to green up quickly, but leaches out of the soil within a few weeks, leaving your grass hungry for more. Slow-release fertilizers are more appropriate for once- or twice-a-year applications. They are formulated to feed grass over time with slow, consistent supplies of nutrients. Synthetic slow-release fertilizers generally contain sulfur- or polymer-coated ureas. There are also many slow-release organic fertilizers available. Organic fertilizers keep your lawn growing at a healthy pace without harming the environment or beneficial soil organisms like earthworms. A good organic lawn fertilizer has a ratio of about 3:1:2. Does Your Lawn Need Phosphorus? In some areas of the country, most soils already contain all the phosphorus an established lawn needs. If you apply more phosphorus, it runs off, causing waterways to turn green from excess algae growth. Those who live near lakes and streams should be particularly careful about using fertilizers with phosphorus. Check with local garden centers or extension offices to see if there are phosphorous restrictions where you live. Apply fertilizer to dry grass and water it in afterward. You can apply it with a spreader that you also use to spread grass seed. It's important to always follow label directions when applying any type of fertilizer. You don't have to be quite as careful about how much organic fertilizer you apply, because over-application poses little danger. On the other hand, it's important not to over-apply synthetic fertilizers. Too much can burn your lawn.